Do you often find yourself overwhelmed with so many things to do at home with so little time? Do you feel as if your life has been evolving just between raising kids and housekeeping? I’ve been there, but I’ve eventually found a way to better manage my time so I can have something left for myself, too. Please read on and see if these five ways will work for you. Among the many challenges of being a stay-at-home mom is managing time at home. Don’t you think? 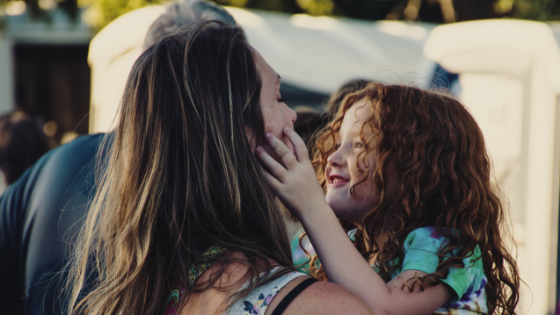 During the first few months of my journey as a stay-at-home mom myself, I struggled at balancing my time between the household chores and my kids. Of course, the kids were always the priority. Next were the household chores. Sadly, I forgot I also had to think about myself. In the next months that came, I tried and tested different means to better manage my time. It was mostly trial and error. Oh, those were the days. Until around November of 2018, I finally found the formula that best works for me. This formula not only allowed me to balance my time between the household chores and the kids — it even gave me time to do my passion. Let me share them with you, and who knows, they might also work for you. A lot has been said about the great benefits of waking up early. Some of them include less stress, enhanced productivity, better concentration – to name a few. I know, most people (including me) hate the idea of waking up early. Who wouldn’t want to just lie down, snuggle in their blanket, and sleep again when the sun hasn’t risen yet? But I guess when you’re desperate, you just want to give a try to everything that you can. And so I did a “Wake Up Early Challenge” for myself, which, though I found difficult to do at first, ended up successfully. I may not be waking up at as early as 5am like what most proponents of waking up early do, but 7am is enough for me to do more than I could have. The results? I became better at planning my day; I finally had an uninterrupted time to write; I was less stressed; I became less grumpy; I’ve read more books now than what I could since I’ve had kids. The most significant result for me of waking up early, I’d say, is finally being able to start this blog. 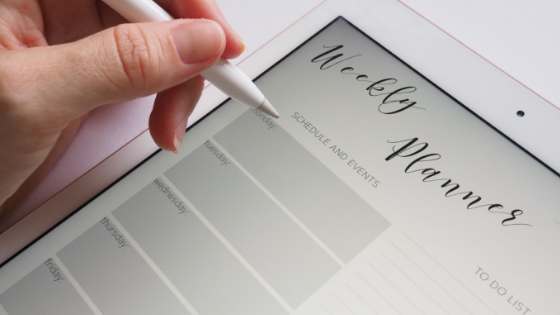 Having an organized schedule may not work for everyone, but for some (including myself again), it’s definitely a life saver. Even before I’ve had the habit of waking up early, I’d rely on a timetable to help me manage my day. But even then, I found it difficult to follow that I’d end up becoming even more disorganized. Waking up early gave me additional hours to spend during the day, and having a timetable couldn’t be any better. As for most moms, I still can’t follow it hundred percent, but now I know it by heart and my body’s already synced in to do whatever I’m supposed to do at a certain time of the day. If you already have a timetable, great! If you don’t have yet and is struggling to make one, I’ll gladly send you over a copy of mine. Just type in your email below. With becoming an early riser comes being a better planner, so they say. And again, it’s true for me. In the morning, when the kids are still asleep and the house is still quiet, I can plan the things I’d focus on completing for the day. I’d normally include some nagging tasks that I’ve been delaying to do, say completing the blogging course I’ve started last year. If there are other tasks I need to tackle but I know it won’t fit in the day, I just write it down and plan it for another day. 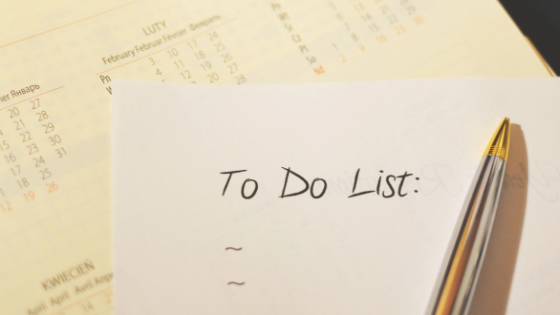 Having a to-do list would help us get on track and concentrate on a few things at a time. It would also give our brain its much-needed rest from nonstop thinking about all the things we need to do for the day. For some, like me, it brings great relief when everything in the list gets ticked off. We’d know we’ve been truly productive. Having a lot more time with the kids is probably the best advantage of being a stay-at-home mom. But for me, it doesn’t mean we need to dedicate a full morning or afternoon playing with them. A few hours here and there is probably enough. As they say, our kids also need individual play times for them to develop their creativity and imagination. In our case, I dedicate an hour in the afternoon, and then the full evening after dinner until before bedtime. That doesn’t mean of course that they get ignored for the rest of the day. In fact, even during the hours I dedicate for something else, they’d come to me and ask me to play with them. I’d willingly submit, because, really, can you say no to them? During those times that I don’t play with them, I either let them watch TV (within their time limit, but I’m guilty of letting them exceed it sometimes), or I let them play with their toys within my sight while I do other things on my list. Just as long as they don’t start jumping on the sofa or climbing on the chairs or pulling the drawer cabinets open, we’d all be fine. Having a dedicated playtime with them allows me to at least not feel guilty when I’m just lying on the bed and taking a rest or reading a book while they play on their own. As long as the room is childproofed, there’s nothing to worry about. 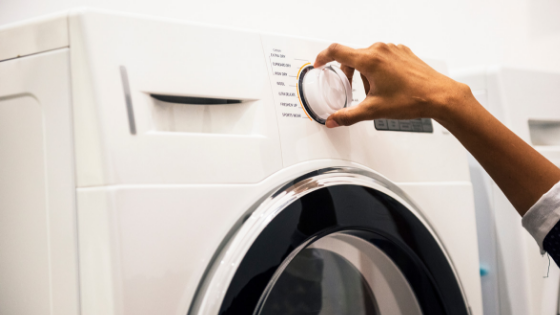 While there’s a dedicated playtime with the kids, I believe we should also dedicate only a specific time for household chores. Because, really, we can’t be doing them all day long, can we? Having a dedicated time for household chores would allow us to try and finish as much as we can. Well, at least for me, it works. The time pressure makes me move in a hurry. In the timetable I made for myself, I allotted an entire two hours for household chores. If I don’t finish everything, I make it up in the afternoon or in the evening. This way, it doesn’t eat up my time and energy. We need to save a few extra of those for the kids and for ourselves. Why only two hours? As we all know, pretty much of what happens in our day are unexpected: sudden meltdowns, sibling fights, potty accidents, etc. And half of those include cleaning up an entire house with toys lying everywhere. It depends how much time you think you need, but two hours is just enough for me. These five ways are what worked for me, and I hope some of them would work for you, too. These ways also allowed me to have time to write and to read — two things which I am passionate about. There’ll always be loopholes, I know, and there are times when I don’t follow them, but as long as we keep on finding ways, we will for sure find ways. 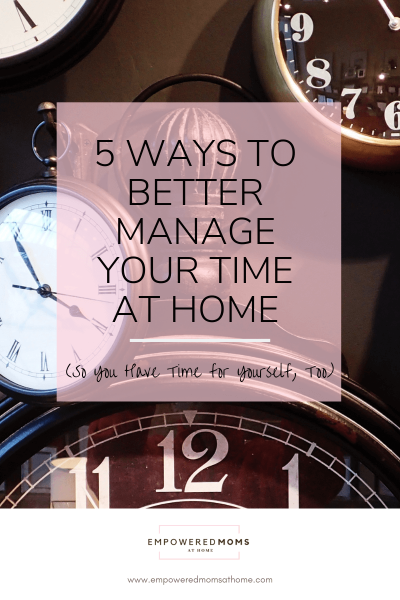 Do you have other suggestions on how to better manage our time at home? Share them in the comments below and let’s learn from one another! For a copy of my daily schedule template, type in your email below and I’ll send you a copy soon. Share this with other stay-at-home moms who you know could be struggling with managing time, too. Another lovely post I have read. i love the way you are able to manage your time as a stay at home Mum. I am not yet one. Still a single lady who loves reading, writing and her work as a Primary Drama and Theatre Assistant. Who knows? When I cross the bridge and get there, I might stay at home with my children to take care of them. I also love how your website is beautifully organised. I hope to have my own website soon! I am ALL about ‘to do’ lists-something so satisfying about checking each item on the list off! 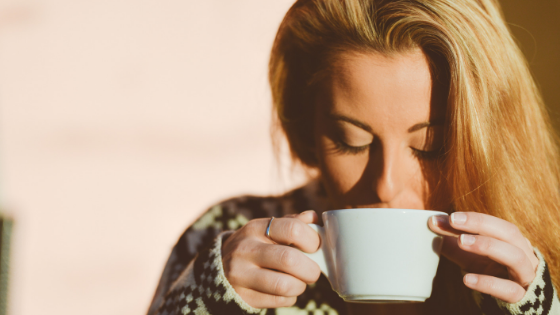 I think it is so important to find time for yourself & these are some terrific tips! I have always considered myself a good manager of my time. My time management skills rocked! Then…motherhood hit! I’ve learned that it all still gets done but in a completely different way than before I was a mom! Same here… I was really good at managing time (at work), so when I became a stay-at-home, I thought I could also nail it. But I was wrong! So I’m just glad I found out these ways. Amazing tips! I so can’t wait to use these tips when my daughter arrives and later on when my husband and I decide to expand our lovely family. I hate to say this because I need sleep but I cannot get anything done unless I get up before the kids. I really think that makes a huge difference. I can get so much more done in peace. Lol. I have also used the Focus Keeper app in the past too when working because Im a WAHM and that made it a lot easier. Time blocking for me is key it really keeps me on track. Great post those suggestions were very helpful. I needed to read this! I work 3 days a week and especially on those days I feel rushed from the time I wake up until the time I go to bed with no time to just relax and do whatever I want to do. I love the idea of waking up earlier than my son and have heard it multiple times from many people but i just can’t seem to drag myself up *yet*!! Yes!!! To-do lists are an absolute must for me. And I like having a physical one so that I can cross things off. It feels so good. I like physical ones, too! I write everything in a notebook that I keep on top of my drawer so I can check it fro time to time, then I tick off whatever’s done. I feel bad when I see something unchecked by the day’s end. This is great! I definitely see the value in waking up before the kids! If I didn’t do that with my daughter, I would never get things done!